Bad Data: What Is It Good For? List some factors that determine data quality. Explain why bad data is so stinky. Explain why good data is so awesome. You’re the Salesforce admin at Gelato, a superhyped new-media technology company. Gelato developed an advanced platform for delivering streaming 4K Ultra HD advertising content. So far it’s used on a slew of TV and movie apps and websites. You’re in the B2B space and your customers are businesses, including advertisers, media agencies, and other ad industry players. To grow Gelato’s business, the new director of sales wants to better identify customers and their needs. Since you’re the Salesforce guru, she asks you to provide a 360-degree view of Gelato’s accounts. You mosey on over to your laptop, crack open a refreshing beverage, generate a few Salesforce reports, and enjoy the shower of praise. You check out the reports, and here’s what you see just for accounts in the western US region. A few things really stand out. Your company has over 500 customers in California alone, but the reports show data for only about 200 accounts in the entire western region. A quick look at a list of accounts shows that data for customers with multiple locations is captured in multiple account records. In fact, so many customers appear in so many records that you’re not even sure what defines a customer. Is it an address? A company name? 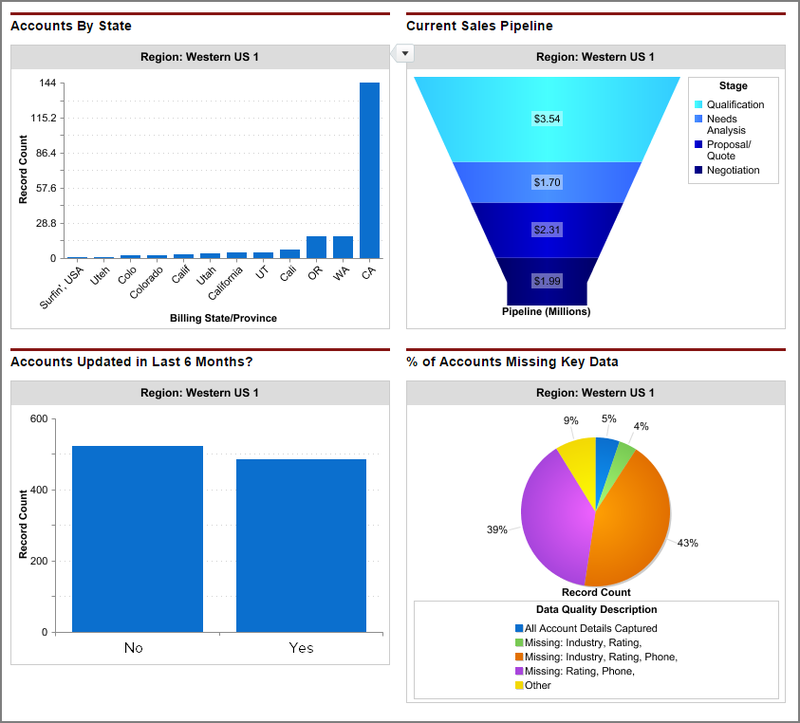 Nearly all accounts in the western region are missing key data. Consumer accounts are missing data like phone and email. Business accounts are missing industry, revenue, and number of employees. At least half of all accounts in the western region haven’t been updated in the last 6 months, so you don’t know how accurate the data is. And that data doesn’t even include accounts not captured in Salesforce. With these kinds of data issues, the report is incomplete at best and inaccurate at worst. Naturally, you’re concerned. You start a Chatter thread asking for input from all your sales managers. A marketing manager from Hong Kong chats, “The leads we’re generating just don’t have enough detail to determine the right actions to take. And it feels like the data we do have is obsolete the day after we get it.” It turns out that he’s right: Data is constantly changing. Turns out data quality is the yeast in the bread of business. Without it, there’s no chance of rising to the top, and you’re left with a sad little cracker of revenue. Inaccurate or incomplete data can lead to 20% stalled productivity, which is one day of work each week. The average company loses 12% of its revenue as a result of inaccurate data. Forty percent of all business initiatives fail to achieve their targeted benefits because of poor-quality data. You find exec after exec warning about the pitfalls of data quality. Check out what Rick Endrulat, president of Virtual Causeway, a leading outsource provider of integrated sales and marketing services around the world, says about data quality. Bad data is preventing you, the Salesforce admin at Gelato, from providing the director of sales with a 360-degree view of your company’s business. Without that view, she can’t fully know which prospects to target, which territories to align, which cross-sell opportunities to pursue, and which leads to prioritize. Ultimately, that gap affects your company’s ability to meet customer needs and grow its business. Imagine all the sales and marketing processes that run off that data. And what if your company acquires its main competitor and you have to merge their customer data with yours? What a nightmare, given the way your data looks today! The list goes on and on. You check out some case studies on the benefits of good data. You start to picture what good data could do for your company. A slow-motion movie montage plays in your head. You envision reps joyously searching accurate and up-to-date records for the contact info needed to convert a lead. Managers spontaneously forming a conga line after realizing how easy it is to align territories and identify new markets now that all records have complete industry and competitive information. Executives lining up to shake your hand after viewing one of your dashboards. All these possibilities don’t create world peace, but they come pretty close. You do say that part to the director of sales. She really likes your vision, but, yet again, she has one question: “Just how bad is our data?” Continue to the next unit for the answer.